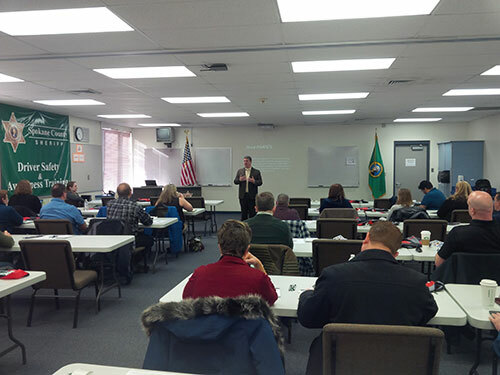 The WA State Association of Public Safety Trainers and Educators first annual conference “Defensible Training and Education: Developing Keys for Success” took place at the Spokane County Sheriff’s Training Center. Steve Lettic, the Associations President and Center Board Member welcomed over 30 attendees from across the state that included employers, CTC CJ program faculty and deans as well as private industry representatives. The two day conference discussed the importance of training that is documented, cited, referenced and easily defensible. Learning outcomes focused on increasing participants knowledge of instructional design and occupational analysis while avoiding implicit bias. The conference also hosted a networking event to help identify participants training needs that can be addressed at future meetings. The HSEM Center of Excellence was a sponsor of this Conference and the SBCTC Criminal justice Programs Working Group met during the conference to review and confirm the common course curriculum that had been developed over the past year. A report will be produced and distributed to all the CJ Programs and Deans on the outcomes of this meeting and steps to move forward on implementing a statewide CJ Core Curriculum. For more information please contact Linda Crerar, Director HSEM COE, lcrerar@pierce.ctc.edu.